“Dedicated to Bobby Jameson” is presented like an old cassette tape you would find at an estate sale and play on your dad’s dusty cassette player you retrieved from the attic. Ariel Pink is an American lo-fi indie artist that seamlessly blends influence and original ideas, his most prominent influence being ‘80s pop. It is clear Pink draws influence from many places, but his music never feels derivative. This is mainly because Pink incorporates strange, sometimes dark, lyrics, dissonant textures, and nuanced effects. He juxtaposes these ideas with sweet melodies and playful instrumentals. 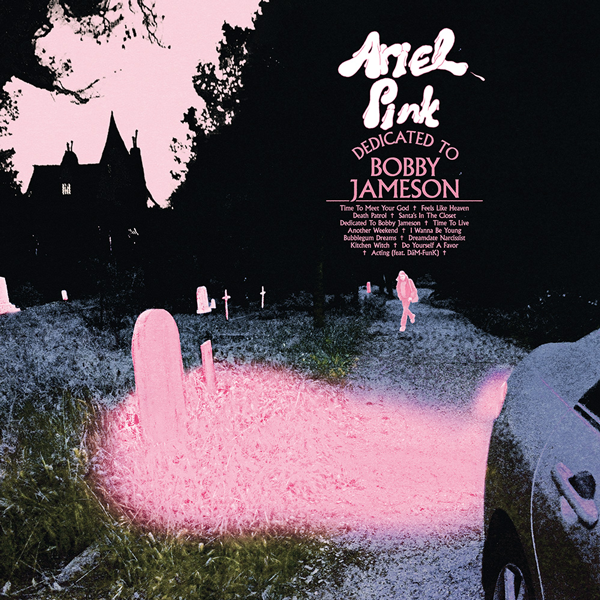 The album cover itself displays this juxtaposition, depicting a pitch black forest looming over a dark church graveyard with pink car lights and a light pink sky. Pink has used this sweet and sour style for many years now and gained a lot of attention for it on his last album, “Pom Pom,” released in 2014. But where “Pom Pom” lacked in momentum, “Dedicated to Bobby Jameson” trims the fat and doesn’t feel its length of nearly 50 minutes. And while this new album is only about 15 minutes shorter than “Pom Pom,” the difference is obvious. The shorter track list and runtime allows for more focus on the individual songs rather than the collection. While his previous albums have had the same style and ‘80s retro aesthetic, Pink kicks it up a notch on this latest release. Certain songs like “Feels Like Heaven” could fit perfectly in a John Hughes scene where the main characters go to the prom. ‘80s pop influence is a big thing in music these days, but no one does it quite like Ariel Pink. Many modern artists take this influence and do not expand on it. For example, “Another Weekend” sounds like a Mac DeMarco ballad because they’re both influenced by the same genre. However, there is a clear difference in the two. Where Mac adds a retro synth over a finger picked guitar drenched in reverb, Pink takes this influence and adds psychedelic elements and interesting song structure, as he does with most of the songs on this album. This is not to say the album is perfect. “Acting” clashes with the rest of the album with its g-funk style, provided by producer Dam-Funk, and its use of vocoder on the vocals. This idea works for Snoop Dog, but not experimental indie artist Ariel Pink. However, I wouldn’t say there is a bad song on the album, some are just not as exciting as others. The highs on this album are incredibly high and the lows are just decent. On “Dedicated to Bobby Jameson,” Pink has expanded on his influence and maintains his originality to create something that feels wholly unique.